All-steel vertical organizer holds many combinations of files, forms, reports, sales orders, folders, proposals, and more in the five 2-3/8" wide slots. 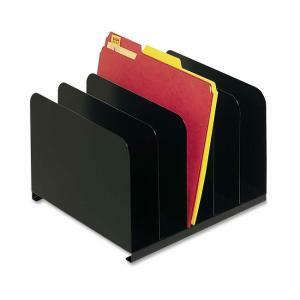 Ideal for corporate offices, home offices, schools, and shared document storage for use by students, teachers, entrepreneurs, and at sales counters. Rounded corners and tapered tops make loading and retrieval of documents fast and easy. Heavy-gauge steel has a scratch-resistant, chip-resistant finish that withstands everyday use. Design also includes nonslip, nonmar padded feet.